NYMEX WTI moves above the psychological price of $60 a barrel. The MPC has decided to maintain its Bank Rate amidst the growing uncertainty over Brexit. With eight days to go for the exit date, the MPs rejected Theresa May’s Withdrawal Plan twice. The PM is now seeking for an extension of Article 50 with the grand debate on a short versus more extended exit date. We expect the GBP to remain volatile until the market is given a clear indication of the direction or shape of the exit plan. The FOMC meeting delivered a somewhat dovish tone yesterday, surprising many in the market and sending the US dollar into a tailspin. Updated forecasts from the central bank point to a lower growth path for the US economy, muted inflation and an employment slowdown. Powell still believes the country is in a good place, but Committee will remain patient and data-dependent given global uncertainties. The famous dot plot is revealing a significant strategy shift from the Fed, with no apparent rate hikes penciled in for 2019. The DXY Index is in recovery mode with the euro retracing from its six-week high. Meanwhile, NYMEX oil futures are trading a new 2019 high, breaching the psychological $60 barrel mark. The market will continue to look into the broader implication from the Fed’s announcement. 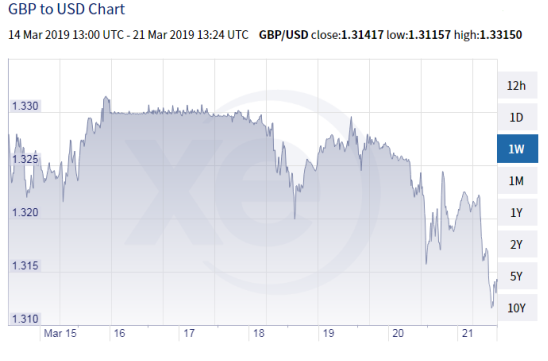 There is no denying that Brexit is in a real mess, the common market is running out of patience with the ever-growing, seemingly never-ending political drama, leaving the British pound vulnerable to heightened volatility. The Monetary Policy Committee voted unanimously to keep Bank Rate unchanged at 0.75%. Brexit–related uncertainties are expected to weigh on confidence and the business community. The debate is now on short versus longer extension of Article 50 – the exit date. The market is keeping an eye on Brussels meeting, whilst the GBP/USD pair remains under heavy selling pressure. EUR/USD is running out of gas this morning. The pair seems very winded after racing to a fresh six-week high near the mid-point of 1.14 following yesterday’s FOMC announcement. The ECB Economic bulletin which was released this morning sent a gentle reminder that whilst the US economy is facing a slowdown; things are far from looking rosier for the euro bloc. The eurozone is expected to see “sizable moderation” in the rate of growth as incoming data has been very disappointing. The central bank also altered is forward guidance, now saying key rates will “remain at present levels at least through the end of 2019” and added a new series of long term refinancing option. EUR/USD is trading lower 0.3%. The Canadian dollar is giving away yesterday’s gains with the USD/CAD closing on near the mid-point of 1.33. The loonie received a boost after WTI touched $60 a barrel and another dovish call from the Fed. However, the rally seems to be transitory and warning from rating agency Fitch is also weighing on the CAD. They believe the recent Federal budget has a “preference for continued deficits” rather than cautious debt management leaves the economy vulnerable to a “faster economic slowdown or sudden shock”. The greenback is making a modest recovery against the Japanese yen after plunging to a five-week low. FOMC signaled that they would remain patient and not in a hurry to hike rates in the medium term. The local market is closed for the holiday, and we expect a weaker 10-year US Treasury yield and Brexit mess to encourage more flows into a stronger yen.